MySQL to MS Access Database Converter software provide facility to convert overall database records or individual tables’ records from MySQL to MS Access database. Database conversion tool migrates all database records or selected columns records which is designed in MySQL to MS Access database. Database converting software easily automates entire complex time consuming task of migrating database records from MySQL to MS Access. MySQL to MS Access database converter program supports all database attributes, database key constraints, schemas, indexes, null value and primary key constraints. Professional MySQL to MS Access database conversion utility is very useful for database administrative, software developers, programmers and computer professional to convert large database records without using any complicated query. Database conversion utility provides a facility to save converted database records at the user specified location for future reference. 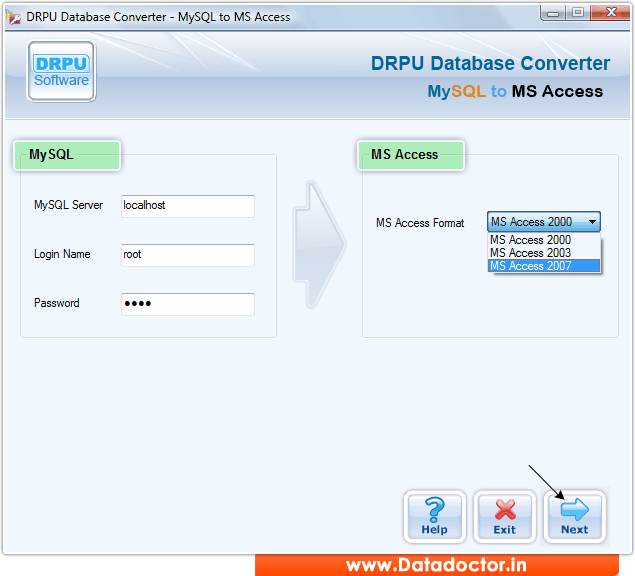 » Database converter software converts bulk database records or selected tables database records from MySQL to MS Access. » Database converting program maintains database integrity during the database conversion process. » Db migration utility supports entire database key constraints including primary key, null value, data types, indexes and schemas. » Database migration tool provide a facility to save converted database records at the user specified location. » MySQL to MS Access database conversion software works with the entire versions of MySQL. » Database converter software has inbuilt advanced migration technique to convert bulk database records or selected data base from one format to another.